AIM is pleased to introduce the first of a new series of publications called ‘Quick Guides’. The AIM QUICK GUIDES have been developed to provide useful and relevant information across a range of topics to help support the work of independent museums. Researched and written by Professionals in the museum sector, the QUICK GUIDES offer practical help in a shorter format to our SUCCESS GUIDES allowing us to cover particular topics in more depth. These guides can be viewed online in PDF format or downloaded and printed. The first publication in this series is ‘Donation Boxes in Museums’ which has been produced by Judy Niner and Amy Richards of Development Partners, sponsors of the AIM National Conference 2015 June 18 – 20 at ss Great Britain, Bristol. On-site donations can play an important role in a museum’s overall fundraising strategy for two principal reasons. First, the very presence of a donation box reinforces the charitable nature of the museum. Secondly, the income itself (with Gift Aid) can be significant, whether unrestricted or allocated to a specific project. This new Quick Guide will support you with the box design, placement and promotion of your donation boxes, plus it offers tips on donation amounts and Gift Aid too. These days, museums across the UK are providing more and more services for their visitors and the communities that surround them. Long gone are the times when museums were simply repositories for interesting artefacts and historical objects because museums today often act as thriving community hubs with different activities and expanded services in place for the public. These additional activities are varied, but include workshops for school children, offering work experience placements for young people and delivering art based projects to help older people socialise. The depth and range of what museums now offer is impressive, plus most museums are extremely aware of their impact on the local and wider environment. Understanding and evidencing your social and environmental impact and the ‘added value’ that your organisation provides adds credibility to what you do, so AIM has now produced a practical advocacy toolkit that will be useful for independent museums, for those with local authority funding, university museums or indeed for anyone who needs to be able to advocate better for their museum. This new AIM Advocacy Toolkit, supported by Arts Council England and developed by DC Research can be used by all museums across the UK and comprises an impact evaluation/assessment framework which has been tested using evidence from a small number of AIM member museums. This toolkit has been designed to help museums fill the gap between the activities and inputs generated by museums and to help them assess their social and environmental impacts. It includes methods of choosing your outcomes, ways of assessing your own selected outcomes and examples of best practice from independent museums across the UK to help you identify your own contributions. There is also a blank template available for download to help you compile your own documentation. So how else can evidencing your social and environmental impacts help you? Increasingly, funding bodies and project partners such as the Heritage Lottery Fund are requiring strong evidence of how your services are used, and being transparent about how you reduce your environmental impact can support future grant applications. In addition, proving your positive impacts and strong advocacy can act as the basis for marketing campaigns and case studies to help attract new visitors to your museum. This new AIM advocacy toolkit also contains useful information about how you can estimate the value of volunteer time for ‘in kind’ funding purposes. As many as 44% of museums who could claim Gift Aid on admissions are not doing so, AIM’s 2014 Autumn Online Survey has revealed. This rises to two-thirds of eligible museums with under 10,000 visitors per year. Reasons given for not cliaming included: “Not enough visitors to justify cost of equipment”; “Scheme too complicated for occasional volunteers to administer reliably, using personal details”, and “HMRC need to make the collection and claiming of Gift Aid simpler for independent museums”. Of the 56% of eligible museums that are claiming Gift Aid on admissions, 42% are using the ‘additional 10%’ scheme and 58% are using the ‘annual pass’ scheme. 37% of the respondents did not qualify at all, as they don’t charge for admission. The AIM survey found 22% of museums do not claim Gift Aid on donations they receive, rising to a third of museums with fewer than 10,000 visitors p.a. All of the respondents with over 100,000 visitors p.a. claimed Gift Aid on donations. The Museums Association (MA) have also recently published an article summarising a report from HRMC which found that £2.3bn of donations were made to charities without Gift Aid being claimed in 2012-13. The report is entitled Gift Aid: Understanding Donor Behaviour, and has led the Treasury to announce it will simplify the Gift Aid model declaration form. The new form should be available early in 2015. The report found that some people were not claiming gift aid because of misconceptions about it, believing that there would be a cost to the charity or to themselves, or that it was such a negligible amount that it was not worth claiming. Others were deterred by an unwillingness to share personal information, or through a general view of form-filling as inconvenient. The full MA article is available here: Museums are losing out on Gift Aid | Museums Association. Members can find out more results from AIM’s survey in the December issue AIM Bulletin, plus discover how museums fared this season in terms of visitor numbers and spend per head. Safeguarding in Museums – who needs a DBS check? SHARE East (the Museum Development service in East of England) and Community Action Suffolk have produced very clear guidance, specifically for museums, on who should and should not have a DBS check. Disclosure and Barring Service checks (DBS checks) replace the former Criminal Records Bureau (CRB) checks for people working with children or vulnerable adults. Online giving platforms have been in existence for over a decade and there are now a large number of operators offering a range of services. As charity supporters have become increasingly familiar with digital financial transactions, taking donations online has become essential. Making the most of digital donations: A practical guide to selecting and using online giving platforms (PDF) offers organisations a strategic approach when choosing a provider and will be a valuable resource for all charities that are looking at how they can maximise their fundraising presence online by working with online giving platforms. The guide will also be particularly useful for smaller charities that may be less sure about how online giving platforms work or what they need to do when working with different partners. Read more and download the guide here: CFG – Taking payments online. Making the most of digital donations: A practical guide to selecting and using online giving platforms is by Charity Finance Group (CFG) and the Institute of Fundraising (IoF), sponsored by and produced in collaboration with Crowe Clark Whitehill (CCW). To see what NCVO say about these things read their blog: Staying afloat without more revenue | NCVO Blogs. 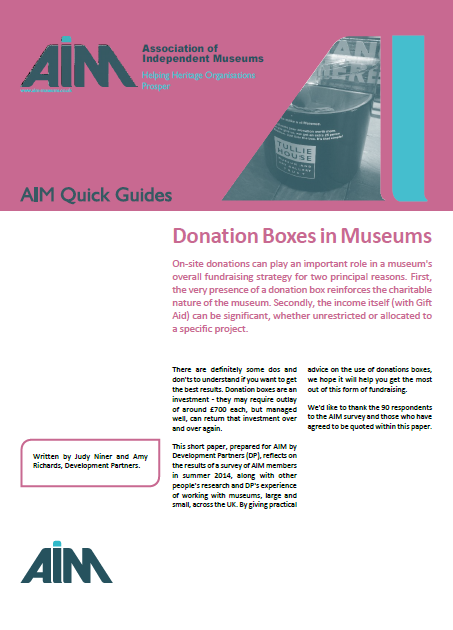 AIM knows just how crucial good Donation Box strategy is for independent museums – large and small – so it has commissioned Development Partners, writers of our current Success Guide on Fundraising, to prepare an online Guidance Sheet to provide easily accessible advice and information on making the most of donation boxes for all our readers. As part of pulling this guidance together Development Partners want to hear from as many, and as diverse, museums and cultural sites, as possible. Please help us by sparing 10 minutes to completes this survey for them. It covers a broad variety of questions, from designs to donation rates, and it will be open until Friday 22 August. Click on this link: https://www.surveymonkey.com/s/donationboxes . All entries will remain anonymous. Thank you in advance for your help; if you have any questions about the survey or the report, please do not hesitate to contact us. Charity law specialist, Farrer & Co, have produced very helpful guidance on recent changes to the law which need to be complied with when using tick boxes to add donations to transactions or when using the ‘plus 10%’ Gift Aid on admissions scheme. The written guidance follows on from the briefing they gave at AIM’s National Conference in June at Black Country Living Museum about some of the legal implications of the implementation of the Consumer Contracts (Information, Cancellation and Additional Charges) Regulations 2013. It applies to England, Wales and Scotland. The new regulations need to be born in mind if your online purchasing systems offer the opportunity to give an extra donation to your charity when making a purchase (for tickets or anything else). The purchaser must consciously opt in to this extra donation. It is not sufficient to give them the opportunity to un-tick a pre-selected donation amount. Care must also be taken with Gift Aid on admissions where the extra 10% method is used. Under this method a visitor is asked to make a donation of at least 10% extra for the cost of their admission ticket and complete a Gift Aid declaration. If they do this, the whole cost of the admission ticket and the 10% donation can be counted as a donation for Gift Aid. The visitor must be given a clear choice whether to pay the extra 10% for a Gift Aid admission or the normal price. Until now many charities have told donors the 10% is an ‘extra’ donation over the cost of a normal ticket. The problem is that statements which imply a division between the ticket price and a donation within a single payment risk both (a) falling foul of the Regulations, as they suggest that an “additional charge” is being levied over and above contractual consideration; and (b) characterising the payment as a “split payment” (as per 2 above), of which only the donation element will be eligible for Gift Aid. As a result, where a charity wishes to use the Gift Aid admissions scheme to claim Gift Aid on the whole amount paid for admission to charity property, it is important to indicate to the customer that the whole amount will be a single payment which can be treated as a donation for Gift Aid purposes. However, provided this is done, and the guidance below is also followed, our view is Regulation 40 should not apply to the transaction, because (a) a different sort of ticket is being sold (one on which Gift Aid can be claimed, in contrast to one on which Gift Aid cannot be claimed) and (b) there is no “payment payable in addition”, as a single price is being paid for a single item (the ticket). We strongly recommend you read the guidance from Farrer & Co via the link below, rather than relying on the summary in this blog!